Canadians might like what they see in Canada’s food guide, but many worry new recommendations could add to the pain of their grocery bills, according to a new online survey from the Angus Reid Institute. 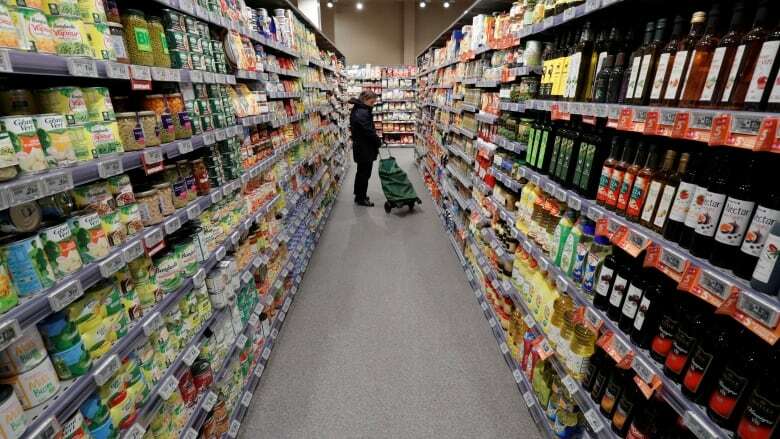 Canadians might like what they see in Canada's food guide, but many worry new recommendations could add to the pain of their grocery bills, according to a new online survey from the Angus Reid Institute. Four out of 10 Canadians surveyed said the new recommendations are out of reach for them or unrealistic, even if they feel they'd like to try the recommendations out. "You've got about half of Canadians ... that say that it's become more difficult for them to just to feed their household over the course of the last year," says Dave Korzinksi, a researcher with the Angus Reid Institute. That was also the case in a similar survey conducted in 2017, he said. 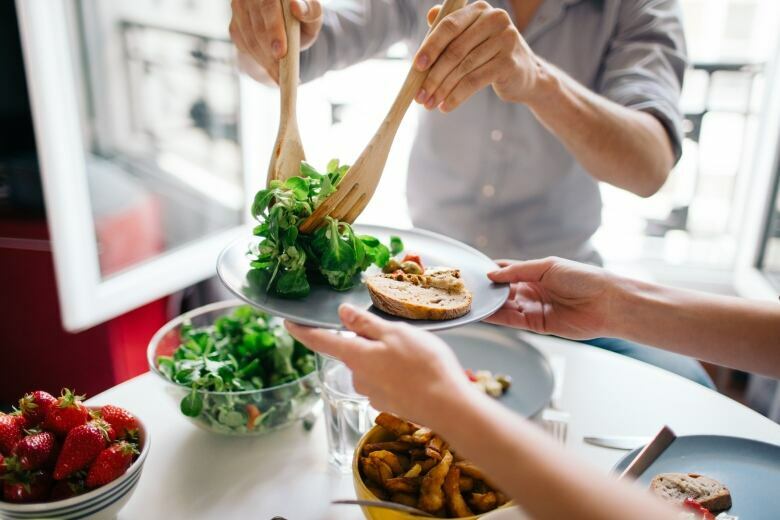 In the most recent Angus Reid Institute survey, researchers showed respondents the new Canada Food Guide recommendations, which includes adding more fresh fruits, vegetables, whole grain foods and plant-based proteins to diets. 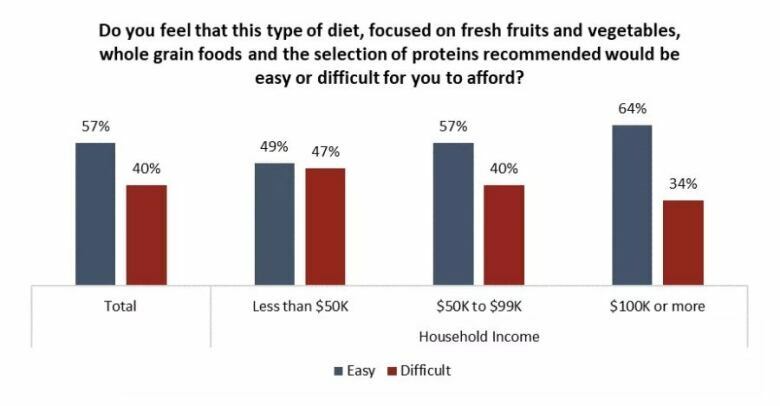 Respondents were asked whether this type of diet would be more easy or difficult to afford. "About half of low income households say they think this is something unaffordable, just based on their purchasing habits and their diet," said Korzinski. He said many Canadians are willing to eat less meat. "They are amenable to that type of diet," said Korzinski. "It's something they're willing to try, but it's something they think is going to be difficult to afford." Canada's Food Price Report 2019, an independent analysis produced by university researchers, predicts the price of meat will drop by as much as three per cent, while seafood will drop by two per cent. However, those drops will be offset by a predicted 4.6 per cent hike in the price of vegetables, according to the food price report. The average Canadian household is expected to pay roughly $400 more for groceries in 2019. Chris Kendall is a registered holistic nutritionist who has eaten raw plant foods for 15 years. He says while people may have the perception that eating to the new Canada Food Guide could be more expensive, there are ways to economize. Pulses, for instance, are grown in Saskatchewan itself, while rice and beans can be bought in big sacks at reasonable prices, he said. "You can be eating for less than one or two dollars per serving or person," he said. People can also reduce expenses by buying in bulk, buying goods that are in season, buying frozen or freezing fresh goods, he said. "We also have to look at the bigger picture — this is an investment in our health," he said, adding that people may also find that reducing meat, alcohol and cigarettes in favour of adding fresh and whole foods creates a healthier overall lifestyle. "It's all a change for the better, and change begets more change." Still, the rising price of food in the face of stagnant wages is a concern Korzinski said politicians could tap into in the upcoming federal election. "Who's going to make these household issues a prominent part of their campaign going forward?" he said. "I think that's definitely something that could be effective politically." The Angus Reid Institute online survey was conducted from March 20 to 25, on a representative randomized sample of 1,600 Canadian adults who are members of the Angus Reid Forum. For comparison purposes, a probability sample of this size would carry a margin of error of +/- 2.4 percentage points, 19 times out of 20.